While we here at Stage 3 love us fast cars moving at high velocity over pavement, we equally love us a well-built truck that can really romp around. 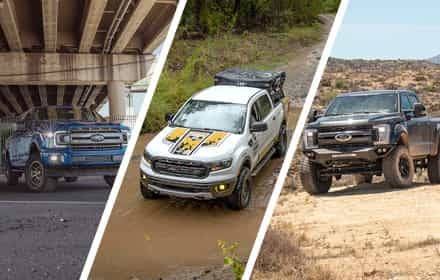 With raw, open desert and wilderness barely a stone's throw away from us, we've had plenty of opportunity to put together some seriously awesome F150s over the years that we've used and abused to our heart's content. We've had everything from quick street trucks to purpose-built off-road rigs that could fly through the trails and brush. 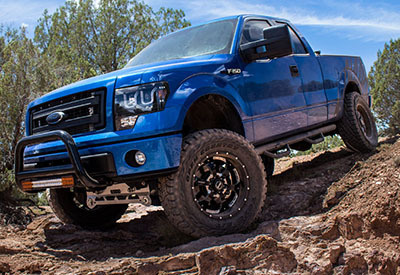 You can check out all of our F150 performance parts right here. This truck was our first 2015 F150, and being the first of the newest generation of F150s that we could get our greedy little paws on, we threw everything at the kitchen sink at this Race Red SuperCrew EcoBoost F150. 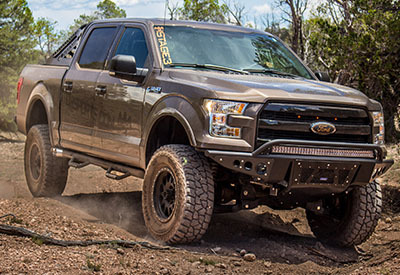 This truck had almost a half-dozen different suspension setups, all paired with serious power-adders, 5-Star Custom Tuning, and enough goodies and accessories to make this truck one of the baddest 2015 EcoBoosts around. You get all the details over on our 2015 F150 3.5L EcoBoost Project Page. 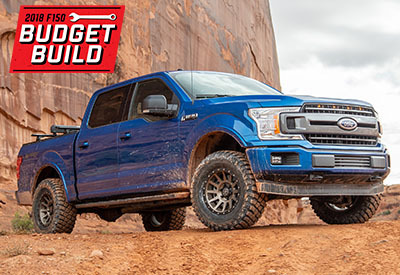 As awesome as it is to go absolutely hog-wild with a truck, it's just as great to put together an F150 that's both clean and capable, which was the end goal for our 2015 F150 2.7L EcoBoost Project Truck. 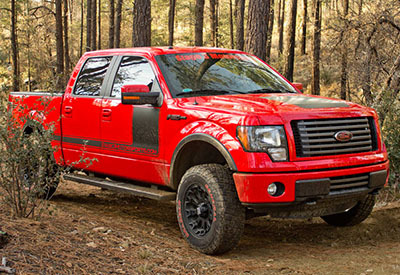 This truck got just enough power-adders and custom tuning to take advantage of the 2.7L EcoBoost's hidden power potential, just enough suspension hardware and tire to let it go just about anywhere without getting crazy, and just enough lighting and accessories to make the truck more capable without looking like a gaudy mess. This truck was a perfect balance of performance and sleekness, and you can get all of the details over on our 2015 F150 2.7L EcoBoost Project Truck Page. Since most of our 2015 F150s so far have all been Lariats, we decided to go for something more basic to prove that you don't need the most expensive truck on the block to have one of the most awesome. All you really need is the right combination of performance parts and an excellent platform to work off of. You can get all the details over here. While most folks consider the Tremor F150s to be street trucks, we went in a little bit different of a direction with our Ruby Red 2014 Tremor build. 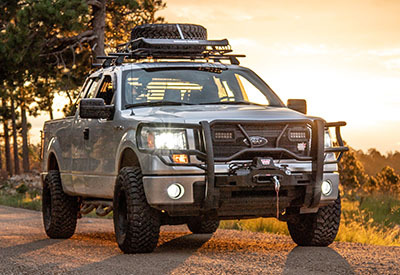 With its short wheelbase, 4WD, 4.10 gears, and factory eLockers this truck makes the perfect platform for a tried-and-true Overland build. We'll be adding suspension, a bed rack, lighting, and all sorts of accessories to transform this Tremor into a go-anywhere adventure machine. 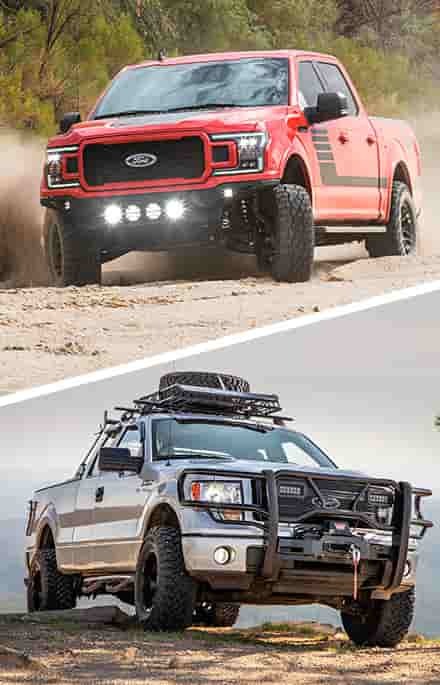 Get all the details on our 2014 F150 Tremor Overland Build Page. 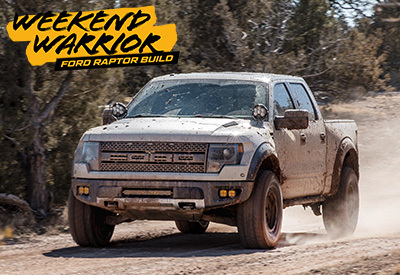 Our 2013 6.2L Raptor Weekend Warrior Build is the Raptor for the working man. With 70,000 miles on the odometer, this thing as been around the block and we're going to do just enough upgrades and modifications to add some pep back into its step, and make it an awesome truck for both off-road adventures and the daily grind.. Get all the details over on our 2013 SVT Raptor 6.2L Weekend Warrior Build Page. We here at Stage 3 Motorsports feel that it's our sworn duty to see how big we can take our trucks, and our 2013 F150 5.0L Project Truck got very big in a very big hurry. What started out as a mild build with a full Fox 2.0 suspension quickly tuned into a huge lifted truck with a 7" lift kit that only got bigger with the addition of coilovers and add-a-leaf kit that took this blue monster to a towering ride height with clearance to fit on massive tires, all while being fed extra horsepower and torque from a powerful supercharger system. Not to mention, this truck got more than its fair share of lighting upgrades, making it one of the most light-happy F150s that we put together. Get all the details over on our 2013 F150 5.0L STX SuperCab Project Truck Page. Owned by a local customer of ours, this 2013 F150 Platinum Edition rocked a 3.5L EcoBoost V6 under the hood that quickly got a bunch more horsepower and torque thanks to one of our powerful Phase Performance Packages and 5-Star Custom tuning. 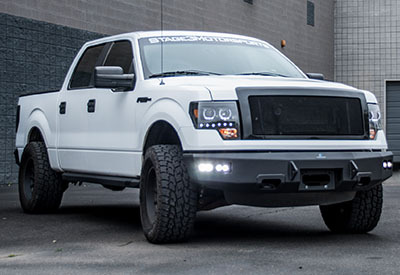 The rest of the truck got decked out with lighting, interior, and exterior modifications which all came together to make this Platinum F150 build really shine. 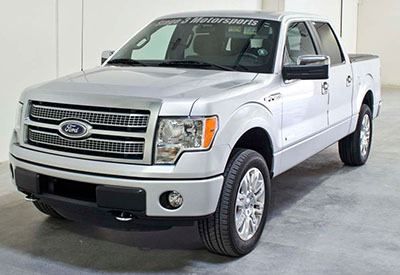 Read more over on our 2013 F150 3.5L EcoBoost Platinum Project Page. With a 3.5L EcoBoost under the hood, 4WD and 3.73 gears out back, this 2012 F150 served as an excellent starting canvas for one serious F150 build, and we went all-out on this aggressive truck with a huge 8" lift kit, 37" tires, front and rear off-road bumpers, aggressive aftermarket lighting, power-adders, custom tuning, and just about whatever else we could get our hands on to make this one of the most most menacing 2009-2014 F150s around. You can read all the details over on our 2012 F150 3.5L EcoBoost FX4 Project Page. 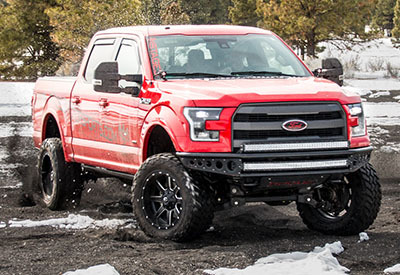 What happens when you combine a Race Red F150 with 4WD and a Coyote V8 with a full ICON suspension system, awesome wheels and tires, and a powerful Procharger Centrifugal Supercharger System? 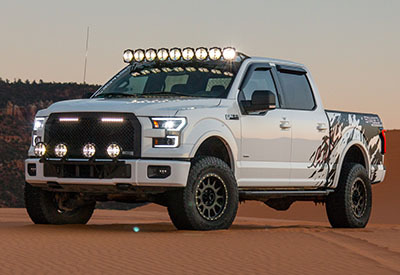 One heck of a truck, and one of the best-looking F150s that we've ever put together. 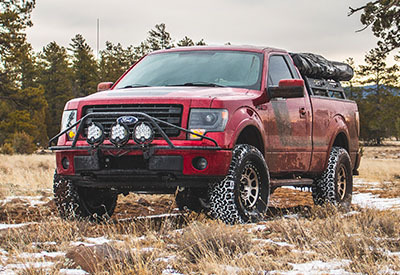 Our Race Red 2012 F150 5.0L was one of our favorite builds, and the end result was a truck that could go just about anywhere as fast as you needed it to, all while looking awesome and rocking a ton of off-road lighting in a clean and mean package. You can read all of the details over on our 2012 F150 5.0L FX4 Project Truck Page. You know those Raptors that never see a single fleck of dirt because their owners are afraid of losing resale value? Yeah, this truck ain't one of those. 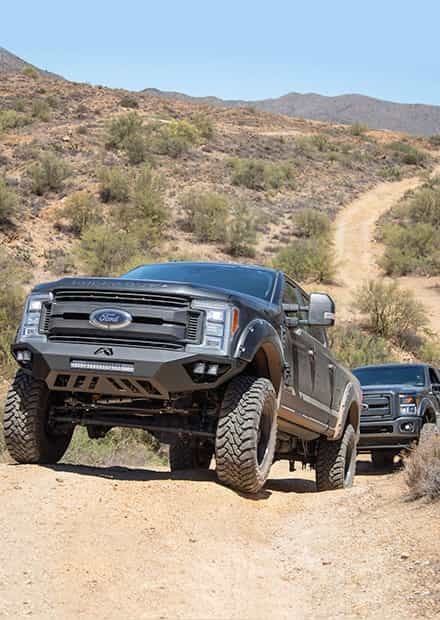 Our Project Desert Raptor was owned by a local customer, and it had enough desert pin-striping down its flanks to prove it wasn't just another Raptor floating around the burbs. This awesome off-road monstrosity swapped out the already capable Raptor Fox shocks for a complete Fox 3.0 Coilover and Bypass Rear Shock System that gave this wicked truck amazing levels of off-road performance and enough ride height to fit on even bigger wheels and tires. 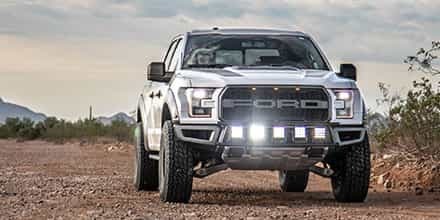 Rounding out the Raptor was an ADD front off-road bumper and complete Stainless Works exhaust system that gave this truck a great look and vicious sound. 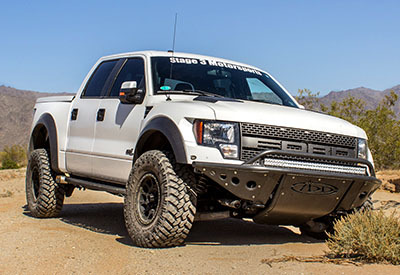 Get all the details over on our 2012 Raptor 6.2L Project Truck Page. The 3.7L V6-powered 2011 to 2014 F150s don't really get a lot of love. 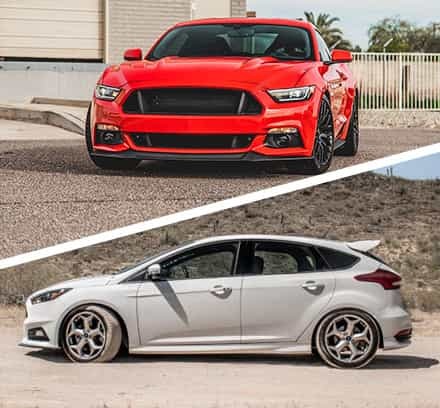 With a V6 putting down almost as much power as the older 4.6L V8 trucks while getting better fuel economy, these things were plenty capable, especially with a few mods. 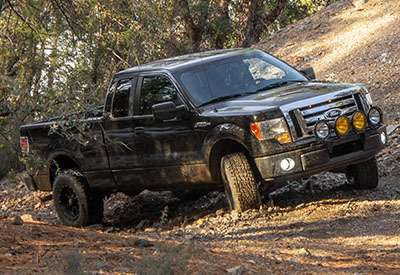 That's why we took a shot at a 2012 F150 XLT with a 3.7L V6 with rear-wheel drive. Our goal was to prove you could do plenty with the lowest rung motor on a basic truck package all without breaking your bank. The end result looked great and performed well both on and off the road. 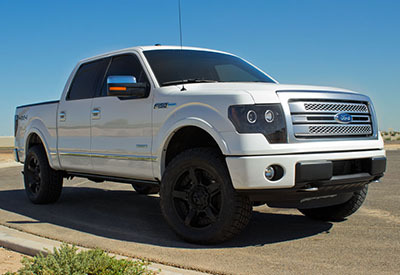 Read all the details over on our 2012 F150 3.7L V6 XLT RWD Project Page. This is the truck that got us here at Stage 3 Motorsports into the EcoBoost game and pushed us more to F150s in general. 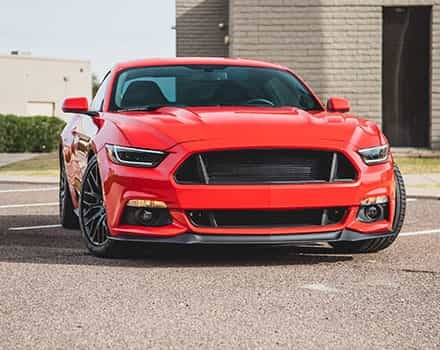 Originally purchased as a general-purpose shop truck for hauling parts and gear around, we fell madly in love with the huge power and power potential of this thing's 3.5L EcoBoost V6 and the fact it was putting all that power down through its rear wheels. 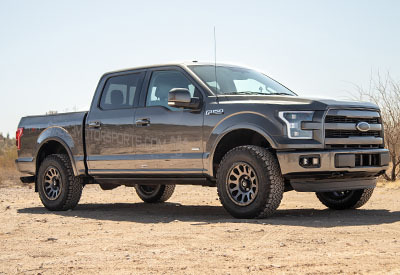 While we didn't go crazy with this truck, it turned out to be an excellent multi-purpose street and hauling truck that got is into the F150 EcoBoost game in a big way. Read all the details over on our 2011 F150 3.5L EcoBoost XLT Project Truck Page. What can you do with a beat and flogged work truck that's seen better days? We're planning on finding out the hard way with our 2011 F150 5.0L XL Project Truck Build. With 174,000 miles hard-earned work miles on the clock, bad hubs and IWEs, mismatched tires, ruined lighting, more than a few dents, and some more holes in the bed than we really need, this truck has seen better days. That being said, it comes with a 5.0L Coyote V8 under the hood, working 4WD, and a clean title for the low price of $9500.00 dollars. While it needs some love, there's a lot of potential for this truck, especially since we saved some cash up front. Read more about this truck over on our 2011 F150 5.0L XL Work Truck Project Page. When it comes down to it, the 2004 to 2008 F150 5.4Ls are still great trucks, even today, and our 2007 F150 XLT turned into one heck of a great truck. 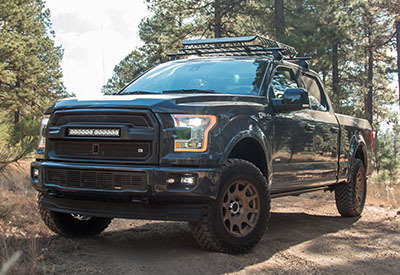 This F150 got de-chromed, lifted, lit up, and custom tuned which transformed it from a basic XLT into a monstrous F150 that was both capable off-road and excellent on-road while looking fantastic doing both. The clean orange-on-black styling theme made it stand out, while it's huge lift and big wheel and tire combination made it look ready to smash just about anything that got in its way. Read all the details over on our 2007 F150 XLT 4WD Project Page. It can be a good thing to buy a truck that's already been decently modified by a previous owner. While our 2005 F150 SuperCrew Project Truck already had a lift kit and decent set of wheels, it needed some TLC and a few upgrades to get into fighting shape. Luckily, not too many. Come check out the suspension, braking, and tire upgrades we made to this previously-lifted F150 to turn it into an excellent do-it-all F150 build that handles itself extremely well both on and off road. You can get all the details over on our 2005 F150 5.4L 4WD XLT SuperCrew Build Page. Your don't really need a massive lift, ungodly big tires, and bunch of stuff in general to turn a 2004 to 2008 F150 5.4L into a capable off-road machine and perfectly decent on-road cruiser. You really need just enough hardware to make it happen. Our 2005 F150 5.4L XLT Project Truck got started out bone-stock and received a 4" lift kit, 35" tires, and enough mods and tuning to get it moving quicker and cleaner, all while some clean off-road lighting and LED upgrades got it putting out more light both on and off the road. You can get all the details over on our 2005 F150 5.4L XLT SuperCab Project Page. The good news about getting a truck with 165,000 miles on it is that you won't pay much, even if it's already equipped with a lift kit and decent wheels. The bad news is that you'll probably have to put in a decent amount of TLC. Our 2004 F150 5.4L Project Truck was pretty tired, but with a little love and effort, we had this truck churning out more power and riding great both on and off the road, which made it into an incredibly fun and capable F150 build. 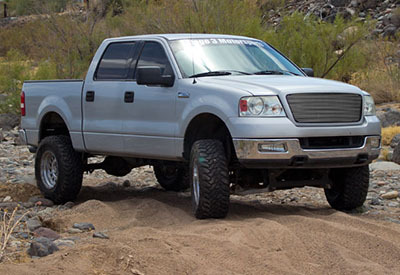 Read more about over on our 2004 F150 5.4L Project Truck Page. The 1997 to 2000 F150s can still be perfectly decent and capable trucks, and there's plenty of aftermarket hardware out there to make them pretty awesome. 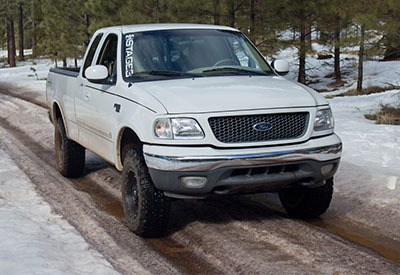 Our very own 2000 F150 5.4L Lariat Project Truck ended up with a suspension and wheel and tire overhaul that provided excellent off-road traction while maintaining great ride quality. Despite its mileage and the fact it had been used to the fullest, this truck turned out great, and you can make your own 1997 to 2000 F150 just as great with minimal effort. Read all the details over on our 2000 F150 5.4L Lariat Project Truck.